My inspirational tops, made by me! lol yea by your own products and its the best way to advertise, is wear them during training days. Ranges from 10-35AUD each! If you are interested, let me know, delivery in US takes around 7 days, and 14-21 days in other parts of the world :). 3-5 days for in-stock items for Australia. I only had one lululemon aparrel in my wardrobe for the past years and it was actually even a good buy getting it for 50%, a jacket. Its very hard and I have to swallow everytime I do a windowshop at their store as most clothes are expensive. And I did compare how the prices for Nike, Lorna Jane and this for their shorts, they actually do not differ a lot, that gave me a reason/justification I should not feel guilty I am spending too much on a running shorts. The time I tried them on, I fell in love with them. So comfy. So light and short but not short enough. Just enough length it gives enough leg freedom. One of the best things I love about it too are the mini pocket in front, where I stash my gels on long runs, that you do not need to reach behind or undo a zipper for a gel and the zipped pocket behind which is handy for keys, and change. I bought two and i love them :). On the last trip to Singapore last April, on our trip to the famous 24/7 shopping center in Little India, Mustafa Center, I saw this interesting water bottle. I still not able to find the best hydration pack for myself for long runs or a hydration belt, so I thought this will do for the moment. I am not a fan of bringing water bottles during training runs but it is hard not to, specially if you are running during summer on an area that does not have bubblers. It tires my arms like carrying weights, ok it might help give you arm muscles but, it is annoying. So I did not know if this weird shaped bottle will make a difference. It is also not very big so I guess it wont be too heavy to run with around. I can always refill everytime I run out of drinks on a water bubbler I see, so the size is not a problem. it can carries 300Ml of liquid. So I had a try one day and brought it with me on a 16Km run. Verdict: Love. It is easy to grip, I have small set of hands so it was just perfect, it was light and not annoying to run with. I was also thinking of it that it can be a medium to protect yourself should you be experiencing an assault during your run (touch wood) it is something solid you can punch or poke their eyes with it. lol. 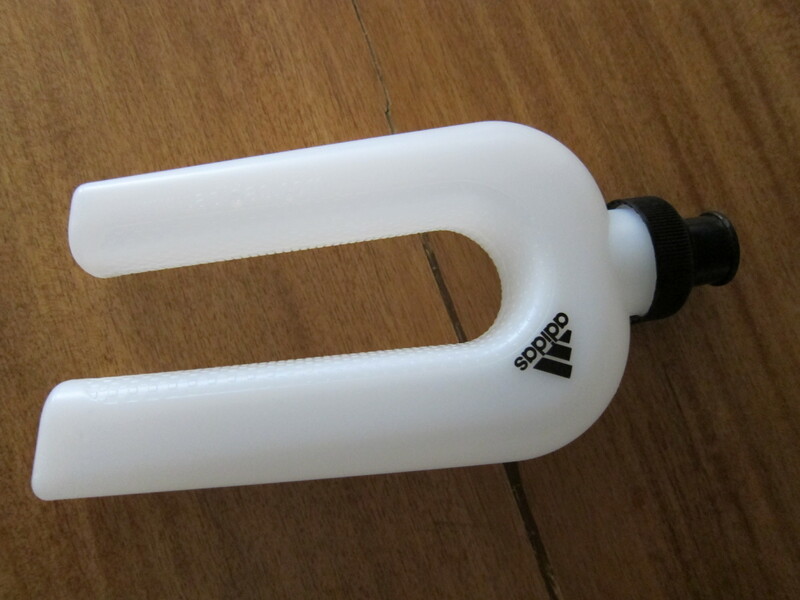 i like this adidas water bottle. Where i can get the same ? I tried looking online, but no luck, i don’t think adidas make them anymore. I bought them at Mustafa Center in Singapore’s lil India. You have a good figure, and good taste! Nice apparels, Chiaket! I didn’t see one like that here in PH.